Depending on why you are visiting the dentist’s office, your feelings may range from impatience to have your teeth cleaned, excitement to improve your smile’s appearance, or anxiety at undergoing an extensive restoration. With years of experience and a caring, compassionate staff, Dr. James R. Keller and the team at Cedar West Family Dentistry are dedicated to making your every visit pleasant and comfortable. Nevertheless, our main priority is helping you ensure that you and your family enjoy beautiful, healthy smiles for life. Therefore, we’ve invested many of our resources into providing advanced dental treatments that not only maximize results, but also help preserve your healthy teeth and oral tissues. While the services we offer a numerous, most can be categorized into three particular types of dental treatment. From preventing issues from arising to restoring dental damage that occurs when they do, we offer a comprehensive array of services designed to meet every patient’s needs. Dr. James Keller and our team are dedicated to providing you and your family with the exceptional dental care you deserve. 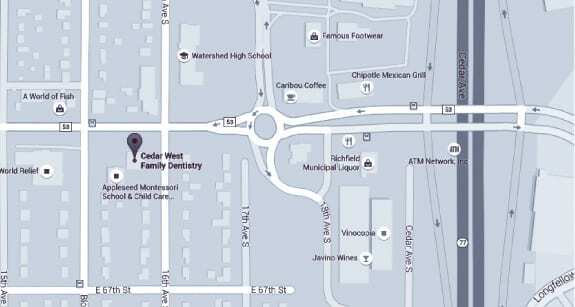 To schedule an appointment with us, call Cedar West Family Dentistry in Richfield, MN, today at (612) 861-7188.